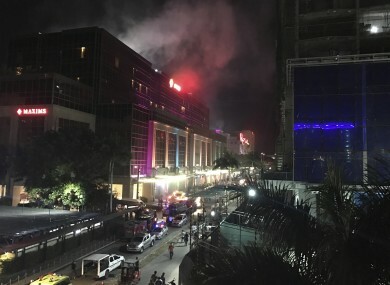 GUNFIRE WAS HEARD at a hotel and a casino resort in the Philippine capital, and the Islamic State group (IS) quickly claimed responsibility. People ran screaming out of Resorts World Manila, which is across a road from one of the main terminals of the Philippines’ international airport, according to television footage. “Resorts World Manila is currently on lockdown following reports of gunfire from unidentified men,” the company said on its Twitter account. IS said “lonewolf soldiers” from its group carried out the attack, according to the SITE Intelligence Group that monitors terrorist organisations. There were no immediate reports of fatalities or injuries. Police surrounded the complex following the reports of the gunfire, which occurred just after midnight. “I was about to return to the second floor from my break when I saw people running. Some hotel guests said someone yelled ‘ISIS’,” Maricel Navaro, an employee of Resorts World, told DZMM radio. ISIS is another acronym for the Islamic State group. “Guests were screaming. We went to the basement locker room and hid there. People were screaming, guests and employees were in panic,” Navaro said. Philippine President Rodrigo Duterte imposed martial law last week across the southern region of Mindanao to crush what he said was a rising threat of Islamic State there. He declared martial law shortly after militants went on a rampage through the southern city of Marawi, which is about 800 kilometres south of Manila. Security forces are still battling the militants in Marawi, and the clashes there have left at least 171 people dead. Duterte said last week he may need to declare martial law across the rest of the country if the terrorism threat spread. A Muslim separatist rebellion in the southern Philippines has killed more than 120,000 people since the 1970s. The main Muslim rebel groups have signed accords with the government aimed at forging lasting peace, giving up their separatist ambitions in return for autonomy. However a range of hardline militants groups have rejected the peace process and in recent years have sought to unite behind IS. One of those groups is the Abu Sayyaf, an infamous kidnap-for-ransom gang that has abducted hundreds of Filipinos and foreigners in the southern Philippines since the early 1990s. It was also accused of being involved in the bombing of a ferry in Manila Bay in 2004 that claimed more than 100 lives, one of the nation’s deadliest terrorist attacks. One of the leaders of the Abu Sayyaf, Isnilon Hapilon, is regarded as the new head of IS in the Philippines. He is believed to be among those fighting in Marawi, military chiefs have said. Email “ISIS 'claims responsibility' after gunfire reported at casino complex in Philippine capital”. Feedback on “ISIS 'claims responsibility' after gunfire reported at casino complex in Philippine capital”.